2. Those in commission: i.e., those delegated to execute Cawdor. 2 Those in commission yet return'd? 9. studied in: thoroughly prepared for. 11. careless trifle: a trifle not worth thinking about. 11 As 'twere a careless trifle. 16-18. thou ... thee: i.e., your deservings are so far ahead of ahead of my power to recompense you that it is hard to catch up. 19. proportion both of thanks and payment: balance of gratitude and reward. 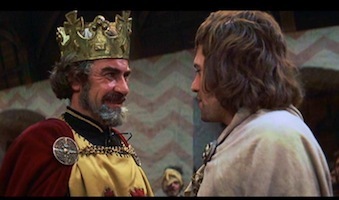 King Duncan says that he wishes that Macbeth had deserved less, so that his thanks and his rewards would at least equal what Macbeth deserves. 21 More is thy due than more than all can pay. 22. The service and the loyalty I owe, / In doing it, pays itself: doing my duty to you is its own reward. 27. Safe toward: to safeguard. 27 Safe toward your love and honour. Nicholas Selby as Duncan and Jon Finch as Macbeth. 32 And hold thee to my heart. 33 The harvest is your own. 35. drops of sorrow: i.e., tears. King Duncan is overcome with emotion. 37. establish our estate upon: settle the succession to the throne upon. 39. The Prince of Cumberland: King Duncan intends this to be the title of the Scottish heir apparent, but there is no such title in Scottish history, so Shakespeare is apparently making things up to heighten the drama. 42. Inverness: The location of Macbeth's castle, Dunsinane. 43. bind us further to you: make me even more obliged to you (by receiving me at your home) . 43 And bind us further to you. 44. The rest is labour, which is not used for you: Any leisure not used for your service is wearisome. 45. harbinger: forerunner, one who announces a happy arrival. 47 So humbly take my leave. 48. The Prince of Cumberland! : This speech raises an interesting question. 51-52. Let . . . The eye wink at the hand: let the eye not see what the hand does. 53. yet let that be: yet let that (the murder of King Duncan) be accomplished. 53 Which the eye fears, when it is done, to see. 54. True, worthy Banquo; he is full so valiant: As Macbeth has been thinking hard about killing King Duncan, the king and Banquo have been talking about what a wonderful person Macbeth is. Banquo has just praised Macbeth as being very valiant, and we hear the conversation as King Duncan is agreeing with Banquo. 58. It: He (Macbeth). 58 It is a peerless kinsman.